We’ve added a few navigational features to the Scalar reading interface this week. We hope you like them. We’d like to thank the generous folks at the NEH’s Office of Digital Humanities for making work on these features possible. 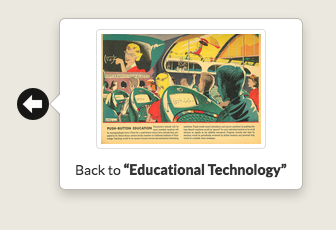 First, we’ve updated the ways readers can navigate backwards and forwards along a path. In addition to path navigation buttons located at the bottom of pages, readers can now access arrows in the wings that will direct them to content immediately preceding or following the current page in a path. Rolling over these arrows will also reveal the title and thumbnail for the content to which it links. Readers can, on a path of media, for instance, now get a preview of what’s next without leaving the current page. Whether for research, collection building or some other purpose, Scalar books can be as expansive, complex and richly interconnected as one requires. Individual items in Scalar projects -pages, media, and annotations, among others- can, for instance, sit at the nexus of several pathways through a project. They can live in multiple contexts. A single page can reside on numerous paths, be tagged by multiple items, or both. Scalar is developed to make these complex interconnections legible to readers by offering a number of built-in visualizations for a book’s content. Today we’re launching an interface element that makes these interconnections even more visible to readers: a new “Context” button. Clicking this button, located in the top-right of the page, reveals all paths within which the current item resides as well as all items that tag it. 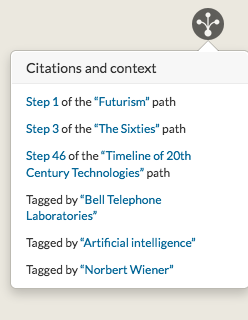 Links are provided to those tags as well as to the current page within other paths, allowing readers to treat those pages as akin to subway stations, getting on/off distinct, but related, narratives, arguments or collections (see figure below). The new “Context” button thus allows readers to better understand the multiple contexts within which the author has situated the current item and makes it easier for them to switch those contexts. A representation of intersecting paths in Scalar. Left: red pages are the same page residing on multiple paths, as are the brown pages. 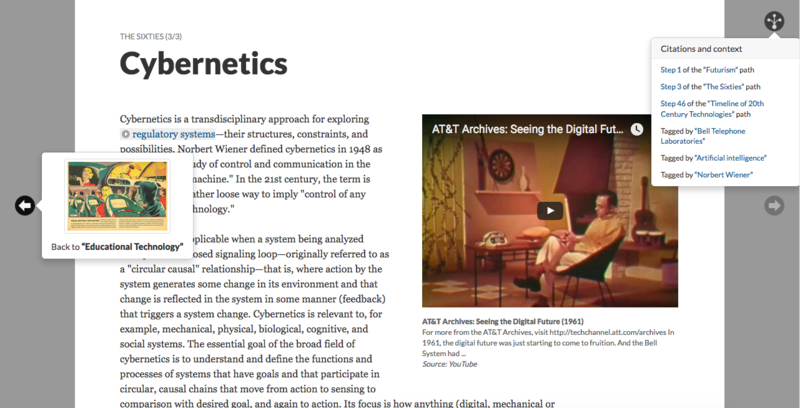 Right: our new “Context” button allows readers to link to and from the same page on multiple paths. As always, please feel free to send us feedback on these new features or just drop us a note about how you’re putting them to use.